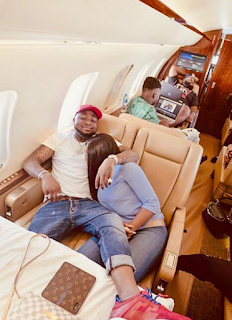 The relationship between the famous music star, Davido and the chef Chioma is one that has been hitting the news almost on a daily basis, but recent information getting to us is that this two finally calls it quit as Davido was charged with ‘infidelity’, getting another lady pregnant while they were still dating. This article is aimed at bring information about the times they had together, their love moments among others, but first let us see a brief about each of them. He was born as David Adedeji Adeleke on the 21st of November, 1992 (Age 26) in Atlanta, Georgia, U.S to the Billionaire family of Chief Deji Adeleke and his late mother, Vero Adeleke. Initially he was schooling in Oakland University in the United States, but could not concentrate properly because he wanted to focus fully on his music career, so he moved back to Nigeria and started releasing hit song s like wild fire, but later went back to Babcock University where he completed his studies. He has done really great when it comes to music. Her identity was not known initially till she started dating the singer, Davido, but the information about her that we know is that she was born as Chioma Avril Rowland on the 1st of April 1995 (Age 23), she is a chef and was in her 300 level in Babcock University before dropping out to focus on her relationship with Davido as they were planning marriage. Being a star, Davido is an attraction to so many ladies out there, and he has dated a few of them in the past, some of whom had babies for him, but he never made it public, people only knew about their relationships based on rumors and when they get pregnant, but he made it public that chioma was his girlfriend. If you are in Nigeria and you have not heard the song ‘Assurance’, then you need to relocate to your real country. That was the hit song he released for her after their dating was made public. It was humorously said then that Davido bought Chioma ‘A miracle’, as the winner of the concluded BBNaija, Miracle won a prize of N45 million, the same amount Davido used to buy Chioma a car, and said “he gave his baby Assurance”. They did not just meet recently, it all happened a long time ago, about five years now that they met. They used to be good friends back in school then before they started dating. They were moving very close to their wedding, as he took her to his hometown to meet his people and best of all, took her to meet with the traditional leader of his hometown, the Ooni of Ife for both of them to receive marriage blessings. To show his love and appreciation for her then, when it was her birthday, Davido rented the entire club just for her to have a nice time without any disturbances, it was filled up with her friends and he announced publicly during the birthday that he will always love her. Attention was drawn to her when they were dating that she even got a N60 million endorsement deal with a company for her cooking.